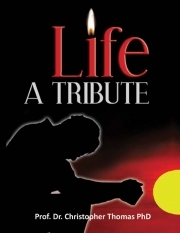 Description of "Life A Tribute (eBook)"
God for us in life is not just a choice but a necessity. For those who dispute the existence of God, this book will show the right direction. For those who believe in God, this book will provide inspiration. The litmus test of faith is to ask whether one seeks God or his gifts. Many people seek God because of their wants. Is this true devotion? What would have been the condition and social order in this world without ethical interventions? This book triggers many such thought provoking questions which are bound to make one realize that beyond the realm of religious, political, and social exploitation, something personal, something private exists called faith, which provides us the drive and passion for life, thus making one's life a true Tribute to God and to all mankind. Read this book to find out more. Reviews of "Life A Tribute (eBook)"